Spring is here, and summer is just around the corner! We’ve been working hard to get our backyard and patio ready for the season of grilling and dining al fresco. We revived a dying plant and created a DIY Pineapple Pot for it. We also added DIY patio curtains. 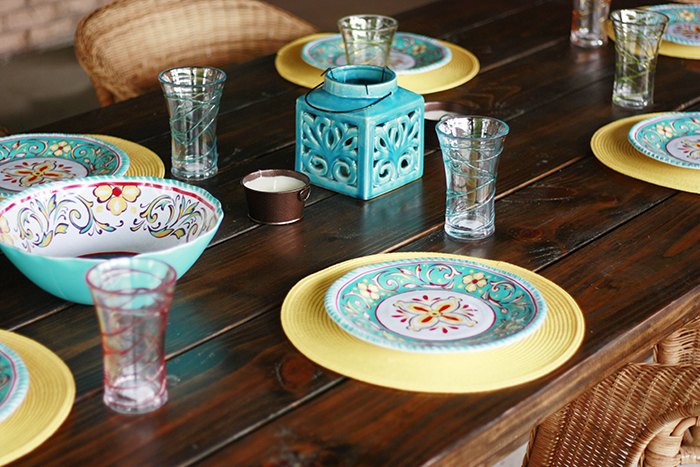 One of our favorite things to do is host friends in our home. We have a weekly bible study that meets at our house (we all take turns bringing dinner) and we needed a table to accommodate a large group. 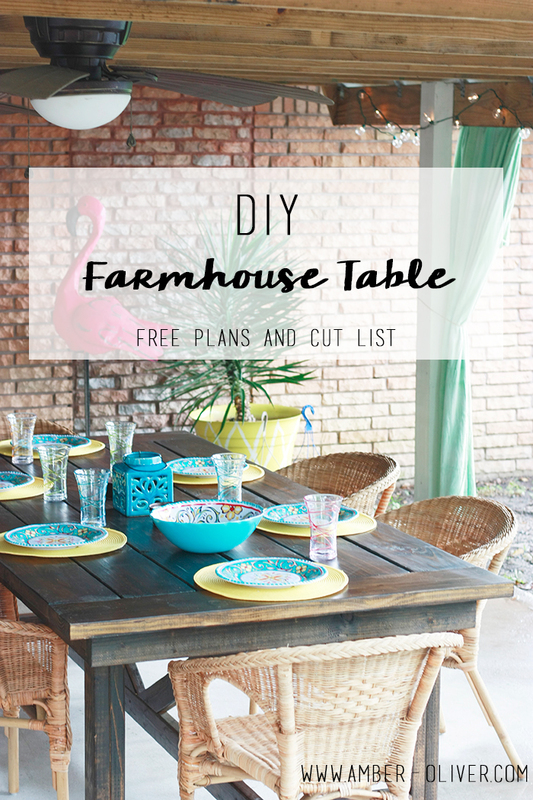 We really wanted a big farmhouse table for our covered patio so I searched and searched for plans. I found several that I liked, but ultimately I liked certain parts of different tables. So we decided to draw up plans for our own DIY Farmhouse Table! We were able to get this outdoor farmhouse table built in a weekend and ready for stain (thanks in large part to our buddy Jeff!). 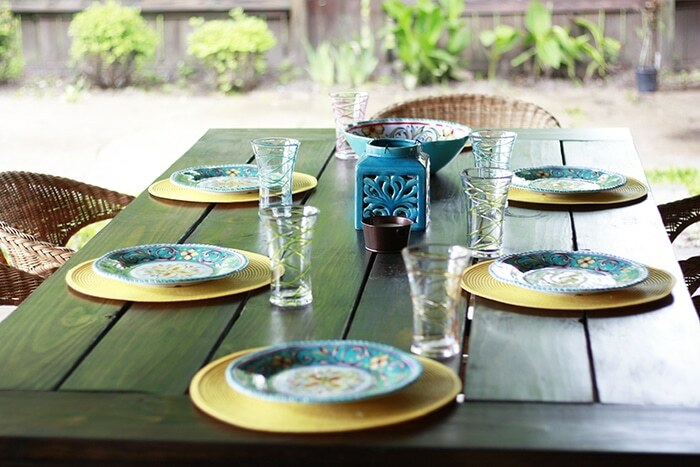 We love this table and have used it many times when we had friends over. 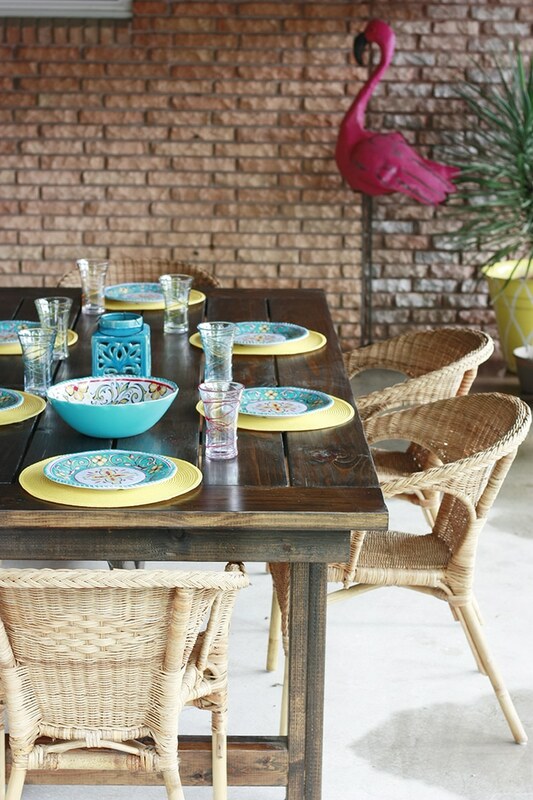 It’s perfect for hosting parties on the back patio! We can fit up to about 10 people around it. Spring is here, and summer is just around the corner! 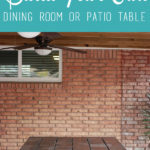 Get your patio ready with a DIY Farmhouse table! I've included plans and a cut list to build your own. 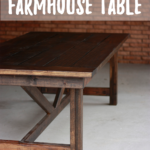 The last steps are to sand the entire table, stain, and apply polyurethane to your new DIY Farmhouse Table! After the table was built it was time to accessorize! 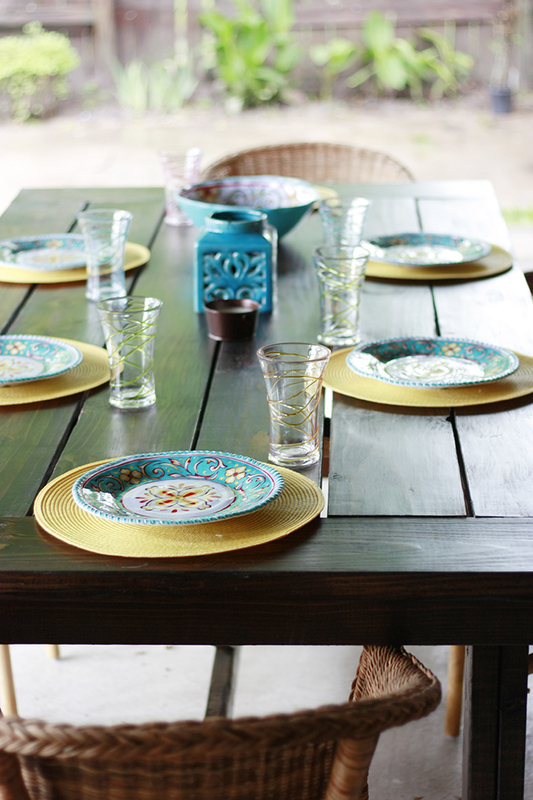 We headed to Big Lots to pick up some table decor and accessories to get ready for an outdoor dinner. 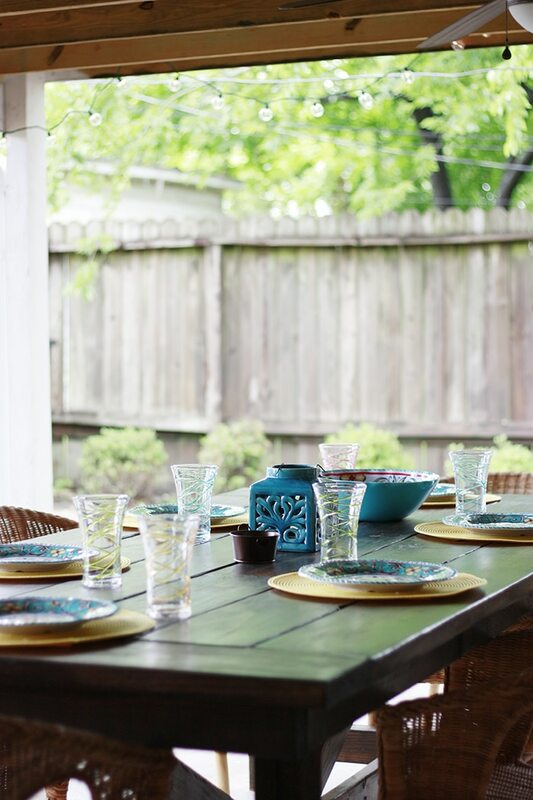 We found tons of high-quality lawn and garden decor products that were perfect for our space. 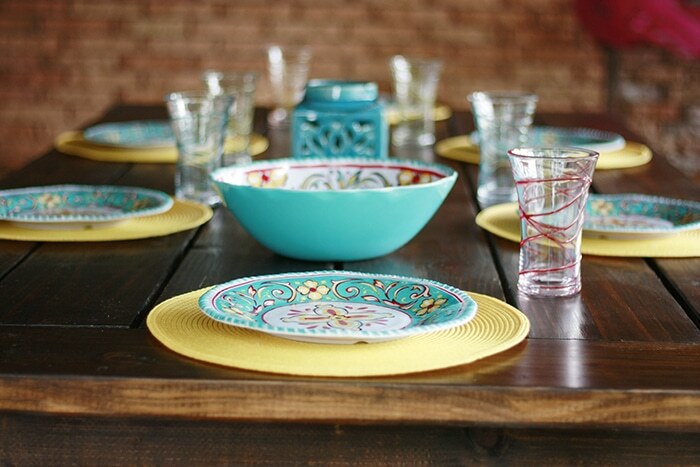 I chose some bright turquoise and yellow accessories that are great for summer! 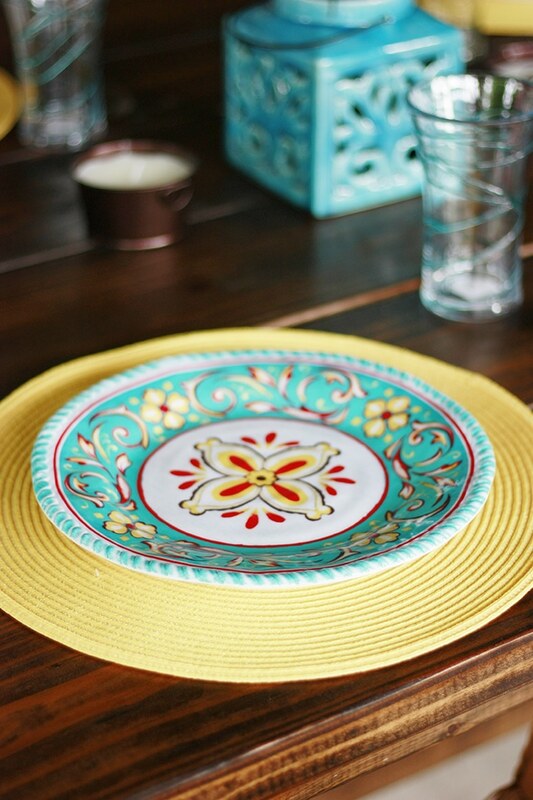 The pattered medallion melamine dinner plates went amazingly with bright yellow place mats. The plastic glasses we picked up came in a variety of colors so it will make it easy to tell cups apart when we have guests. I loved that everything was value priced, on trend, and easy to mix and match. We also picked up some serving bowls and platters that will be great when we grill! One of the things I was most excited about finding were the outdoor lights! 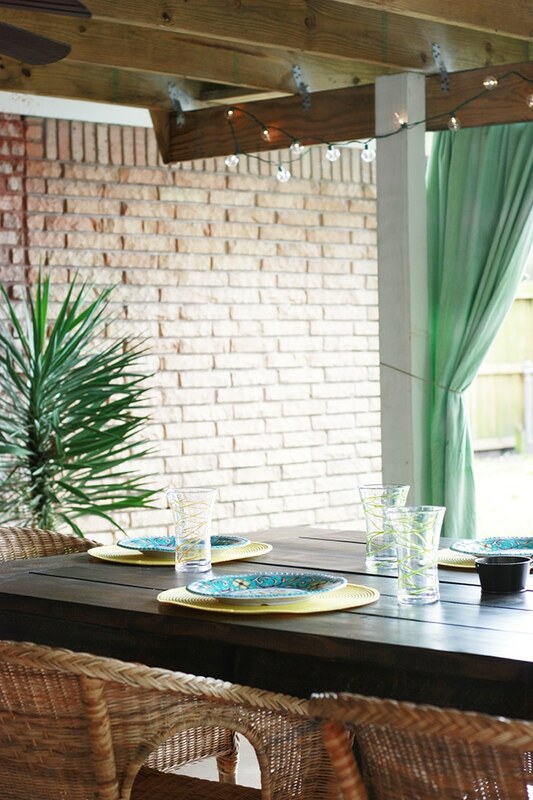 Big Lots had a large selection of outdoor lights, and we chose some cool globe lights to string around our patio. I love the mood these lights create and feel like they really completed the look! We also picked up a lantern and some candles. They had several citronella candles so we’ll be able to ward off bugs and keep the party going! Is your backyard ready for summer? What outdoor projects do you have on your “to do” list? 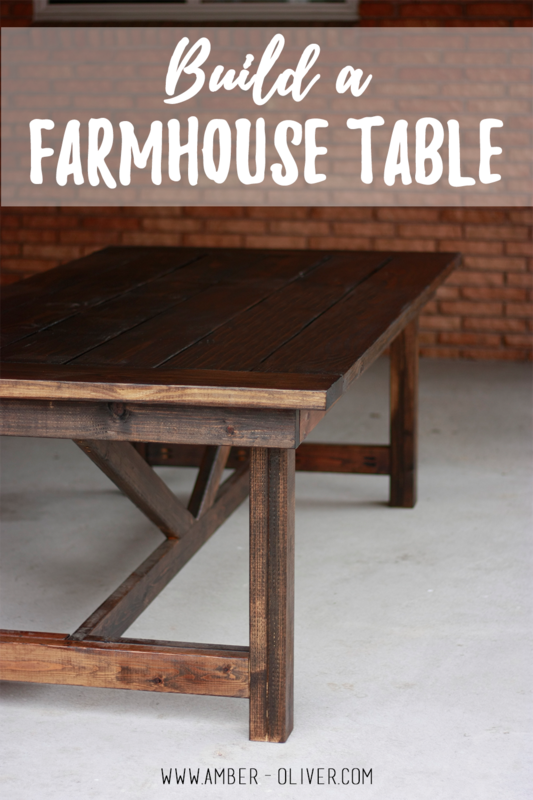 If you decide to use our the DIY farmhouse table let me know in the comments below! that is incredible! such a beautiful table. very cool post! What kind of wood is best for this project? Love this! What is the rough estimate of cost to make this table? Looks great!! It looks slightly two-toned – how were you able to do that?